I'm a little too busy to list all the emails customers send me but here are just a few examples of those I receive. Over 99% of my customers seem to genuinely appreciate how we make our own machines, sell them direct, and offer lifelong service helping them get great results. I received my new unit today and put it to use right away .Works great! It’s the details that make and keep happy customers. Received my MaxBlaster Pro a couple of weeks ago and it surpasses all of my expectations. Have only used it a few times but the results have been fantastic: odors gone and a fresh clean smell left behind. Later this fall we will try it on a 1972 Mercedes that has been in storage (unheated garage) for more than 20 years. GREAT PRODUCT AND GREAT AMERICAN COMPANY! btw: Thanks for the upgrade to the pro. It's truly a great unit. 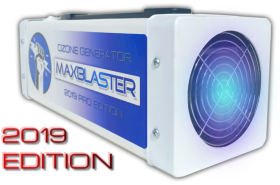 Thank you for allowing us to test out the MaxBlaster ozone generator. It works very well and keeps the odor of items in our evidence room down to a minimum. While I doubt any ozone generator can render the odor of certain items undetectable to the discerning nose of a trained officer or K-9, the MaxBlaster has made the area around our evidence room very tolerable. I would recommend the same machine to other departments with similar needs. Used Max Blaster for 1 hr treatment smell gone, will recommend to everyone I meet , that impressive! Sending pic of how I treated my Limo. Just a quick report on the Salve that Ed dropped off for me to try… As you already know we now have 2 of your OZONE machines and we have used them to kill multiple mold issues as we work in peoples homes. I have used them in my cars and trucks to also remove musty orders due to mud in trucks etc. THEY SIMPLE WORK PERFECT THE FIRT TIME / ODER GONE_/SORCE OF ODER GONE! So I was already an advacate of OZONE thinking! I have been doing my own research on different things that would help people heal wounds that are found throughout the world. As you know we do mission work in various countries were medicine is almost non existent due to the remote areas.. As I was researching basic ideas i WAS drawn to what did they do in early times that were recorded in Scripture… If your recall anything throughout Scripture it is that they used Olive Oil for just about anything that needed healed ///// SO WHY LOOK ANY FURTHER! I had also been intriged with Oxygen chamber therapy , Pure air is an almost perfect killer of Bacteria/// SO when you put the two together its most assuredly going to do something?!?!?! Well the day Ed dropped the salve of and asked me to try it I had been the victim of a Pyle of plywood tipping over and going down my shin! It took off hyde/ hair, bone —I was a mess! So I thought what better test than me! Within 10 days of applying ONLY this ------not only did I heal but there is NO Trace of any injury ! Next I had a very prolonged case of ( Jungle rote) The same thing solders get ! I had gotten it in 1990 in West Africa and had been treating it for all of these years— trying every brand of fungus killer there is! Within 4 days this 20 yr old haunting itch is gone! Toes have completely cleared! I am now comparing it on split fingers! I am outside alot and they simply dry out! This has really helped but its hard to go somewhere with it on due to the OZONE oder! Thanks for letting me be a test run!! It will always be in out supplies from now ON! Hi it's Jonathan in Port Charlotte Florida. I moved back into my house a couple of weeks ago, and I'm painting and doing other interior finish work. I just want to say, apart from getting a new roof and stopping any further water intrusion, my Maxblaster ozone generator has been the biggest factor in making my house a clean, safe, odor free and comfortable environment again. I think the indoor air quality at my place is even better than my friends house where I was staying while my house got a new roof and remediation. multiple treatments on a timer during the nights that I was away, was a big factor too. Using a hepa-vac and doing other work on the house helped, but the real difference was ozone. I will continue to run ozone treatments every so often while I'm out of the house, to keep any possible mold, bacteria and odors away. Really, really, very pleased with the quality and performance of both of the MaxBlast units you've sent to me. ... not just the usual expected blather of self-serving window dressing come-on.